The November 2018 Mussel of the Month is Coelatura cridlandi. Coelatura is a genus of 22 species known only from sub-Saharan Africa and the Nile. MRAC 517603. Harrington Bay, Lake Victoria, Uganda (type). 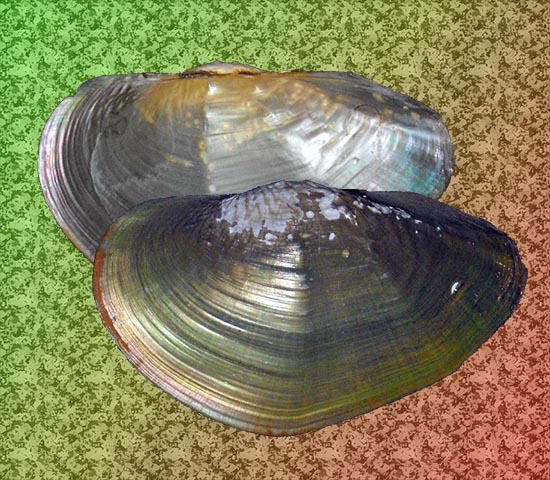 There are a couple good reasons one might highlight C. cridlandi as the Mussel of the Month. We have previously featured two other species of Coelatura (C. aegyptica and C. lobensis). However, the genus isn't monophyletic (Graf et al., 2014). Since the various lineages, after they have been studied in more detail, may be split among various available names (e.g., Zairia), C. cridlandi might anticipate further increases in freshwater mussel genera (as we documented earlier this year). That would be as good of a reason as any to shine a spotlight on this species. But we chose C. cridlandi this month because it is one of only 51 freshwater mussel species described during the 20 years from 1940-1960. Of those, 29 were described as species (i.e., not subspecies), and only 10 are still regarded as valid. In the preceding 20 years, 268 new species and subspecies were named, with 50 still valid, while in the subsequent two decades, 67 were described and 21 are valid. Even with the general trend of fewer new species-group level taxa being described (in the 1st decades of the 20th century, there were 585 and 1449 before that), the lull from 1940-1960 is noticeable. The chart shows the number of publications and taxonomic opinions in the MUSSELpdb by decade since 1750. The big red downward arrow corresponds to a lull in freshwater mussel taxonomic work after World War II. The big green upward arrow indicates exponential increase in publications and taxonomic opinions in our dataset from more recent years. We discovered this pattern while investigating the history of publications and the use of freshwater mussel names over the last 260 years. The chart shows the number of publications and "taxonomic opinions" that relate to Recent freshwater mussel species by decade in the MUSSEL Project Database. “Publications” refers to sources of information about freshwater mussels like articles, books, parts of serial volumes, and even some web sites like WoRMS and the IUCN Red List. “Taxonomic opinions” are the citations of species names — whether valid or as synonyms. At this moment, we have a total of 2066 publications and 68,648 taxonomic opinions relating to Recent freshwater mussels, and these data, as well as specimen records, form the basis of the MUSSELpdb. We obviously haven't captured every publication and every use of a mussel name since Linnaeus, but we perhaps do have a big enough sample to see meaningful trends. 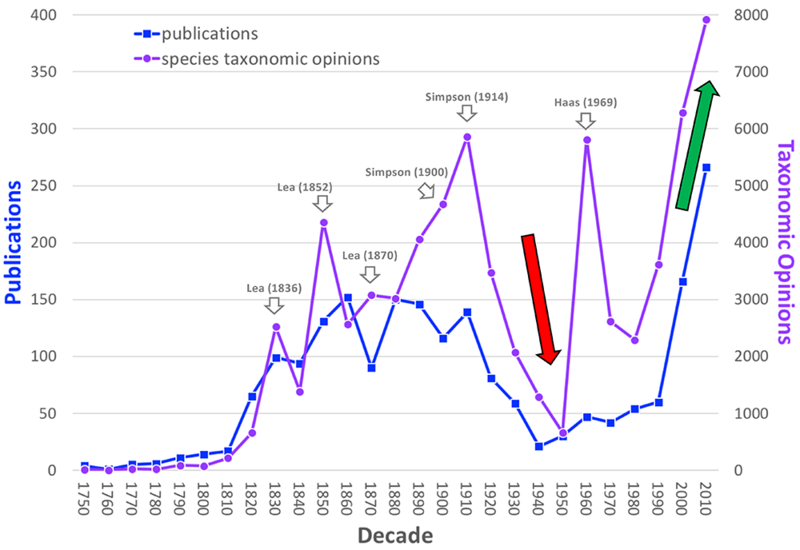 When it comes to taxonomic opinions, several high peaks are evident for certain decades, and these correspond to comprehensive global treatments of mussel diversity that provided extensive synonymies (e.g., Simpson, 1900, 1914; Haas, 1969) — lots of opinions. Also evident is the trough during the 1940's and 1950's: the post war years. Malacologists were still doing some work, but their rate definitely slowed while people were distracted rebuilding the world. Local work was going on, like Mandahl-Barth (1954) in Lake Victoria describing C. cridlandi, but between Simpson (1914) and Haas (1969) no one was on the beat of global freshwater mussel species diversity. And, after Haas (1969) the next global treatment was our own (Graf & Cummings, 2007). At this moment, we are in an exponential explosion of publications and taxonomic opinions that correspond to the arrival in the 1990’s of the Internet and phylogenetic studies of freshwater mussels. (Presumably, our dataset has some bias towards the most recent decades, too). These data are served to you, gentle-reader, in the MUSSELpdb on this web site. For example, for any nominal species, the whole “taxonomic history” of opinions is provided. Click here to see an example for Coelatura cridlandi. The “taxonomic opinions” associated with each publication are also available, such as Graf & Cummings (2007). Graf, D.L., A.J. Geneva, J.M. Pfeiffer III & A.D. Chilala. 2014. Phylogenetic analysis of Prisodontopsis Tomlin, 1928 and Mweruella Haas, 1936 (Bivalvia: Unionidae) from Lake Mweru (Congo Basin) supports a Quaternary radiation in the Zambian Congo. Journal of Molluscan Studies 80(3): 303-304. Lea, I. 1836. A Synopsis of the Family of Naiades. Philadelphia, Pennsylvania. Cary, Lea and Blanchard. London, John Miller. 59 pp. Lea, I. 1852. A synopsis of the family of naiades. 3rd Edition. Philadelphia, Pennsylvania. Blanchard and Lea. 88 pp. Lea, I. 1870. A synopsis of the family Unionidae. 4th Edition, very greatly enlarged and improved. Henry C. Lea, Philadelphia, Pennsylvania. 184 pp. Mandahl-Barth, G. 1954. The freshwater mollusks of Uganda and adjacent territories. Ann. Mus. r. Congo belge 8° Zool. 32: 1-206. Simpson, C.T. 1900. Synopsis of the naiades, or pearly fresh-water mussels. Proceedings of the United States National Museum 22: 501-1044. Simpson, C.T. 1914. A Descriptive Catalogue of the Naiades, or Pearly Fresh-water Mussels. Parts I-III. Bryant Walker, Detroit, Michigan. 1540 pp.